PYEONGCHANG, South Korea, Jan. 26, 2018 /PRNewswire/ — South Korea’s Ministry of Health and Welfare and the Korea Health Industry Development Institute have opened the Korean Medicine Center in Gangneung Media Village to help keep reporters and journalists visiting from around the world in good health while they report on the Olympic Winter Games PyeongChang 2018. The Korean Medicine Center also opened during the 2015 Gwangju Summer Universiade, where it provided medical services to 532 athletes from 100 countries, who accounted for 66.9 percent of all visitors to the Korean Medicine Center during that time. Korean Medicine treatments, including acupuncture, cupping (moxibustion) therapy, and chuna manipulation therapy, were popular among the athletes, as they are effective in relieving pain and preventing injury without causing side effects or doping problems. The Korean Medicine Center has been opened in Gangneung Media Village to help promote the health of the athletes and members of the press during the PyeongChang 2018 Winter Games by providing Korean Medicine consultations and various Korean Medicine and treatment services. The center is located at the heart of the village, making it easily accessible from the nearby media main dining hall, airport check-in center, and NBC work center. A website has also been launched for the center so that people can make appointments and receive treatments at their convenience. Doctors from 13 representative Korean Medicine hospitals and clinics in Korea, will provide Korean Medicine health care and treatment services at the Korean Medicine Center. And specialized Korean Medicine treatments will be provided on the weekends, especially for hair loss, skincare, and dieting. Korean Medicine has achieved remarkable advancements based on Dongui Bogam, a book on Eastern medicine written by Heo Jun. Built up around the concept of providing treatments for the purpose of preventing disease, Korean Medicine has grown into a modern-day, evidence-based field of preventive medicine that focuses on getting to the root of health issues and providing treatments that are suited to patients’ constitutions rather than simply treating patients after symptoms appear. 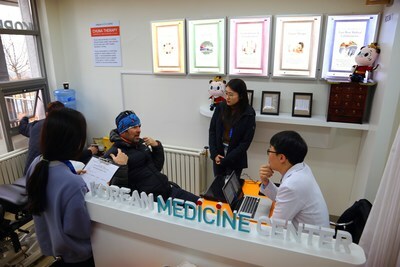 As one of the most unique establishments at the Winter Games, the Korean Medicine Center is a place that each member of the foreign press delegations should visit at least once. The Korean Medicine Center at the Olympic Winter Games PyeongChang will be open from 7 a.m. to 7 p.m. over a period of 42 days, from January 15 to February 25, the day of the closing ceremony of the Winter Games.